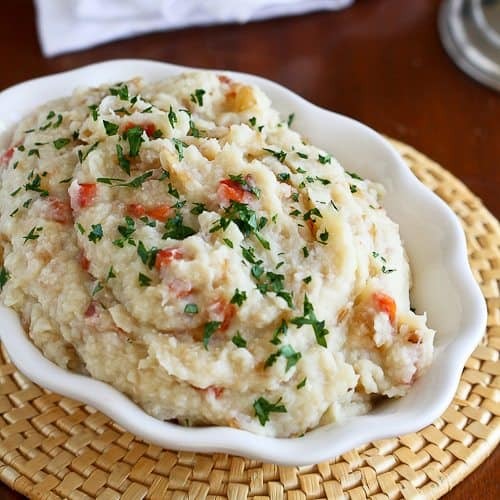 Serve up this light, dairy free Vegan Mashed Potato & Cauliflower dish, with roasted peppers and caramelized onions for Thanksgiving this year. Thank you to GO Veggie! and Kitchen PLAY for helping me to share this recipe & giveaway with you. Whether you follow a vegan diet or are trying to eat lighter this holiday season, or you have a vegan guest or relative at your Thanksgiving or holiday table, this mashed potato and cauliflower is a fantastic option. Making sure everyone you love is taken care of (at least feast-wise) is all a part of spreading the holiday cheer. Considering that mashed potatoes are typically laden with milk or cream, and plenty of butter, coming up with a lighter, vegan version requires some tinkering. But have no fear, I have tinkered and tasted on your behalf. The result is a recipe that will impress all of your guests, not just those looking for a dairy free alternative. So, what’s the trick? This recipe uses a mixture of potatoes and cauliflower florets, mashed to a smooth texture, and spiked with sweet caramelized onions and smoky roasted red peppers. 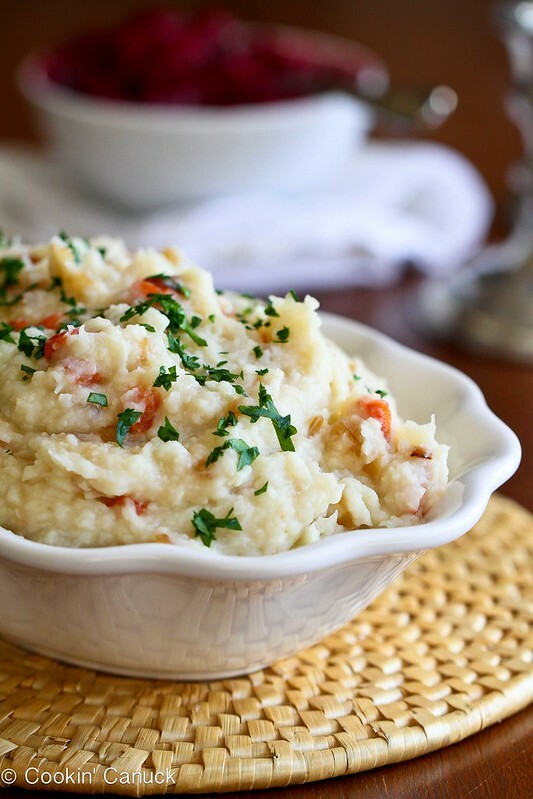 The cauliflower provides a lighter texture overall…not a typical dense mashed potato texture. The trick to the creaminess (without the cream) is twofold. Instead of milk, I used almond milk. Then I added a good dollop of GO Veggie! Dairy Free, Vegan Classic Plain Cream Cheese, which is a vegan cream cheese alternative. There is no cholesterol in the cream cheese and the saturated fats are plant-based. GO Veggie! 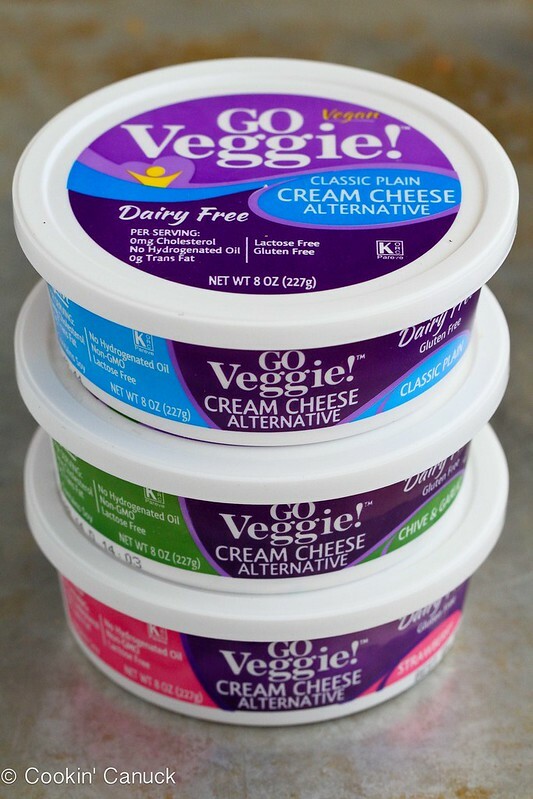 dairy free, vegan cream cheese alternatives come in three flavors: classic plain, chive & garlic (which would be fantastic in this recipe, too) and strawberry. You can check out the ingredients lists and nutritional panels here. This recipe is very flexible. Think of substituting a mixture of fresh herbs for the caramelized onions or stir in some roasted garlic for an extra layer of flavor. Heat the olive in a large skillet over medium heat. 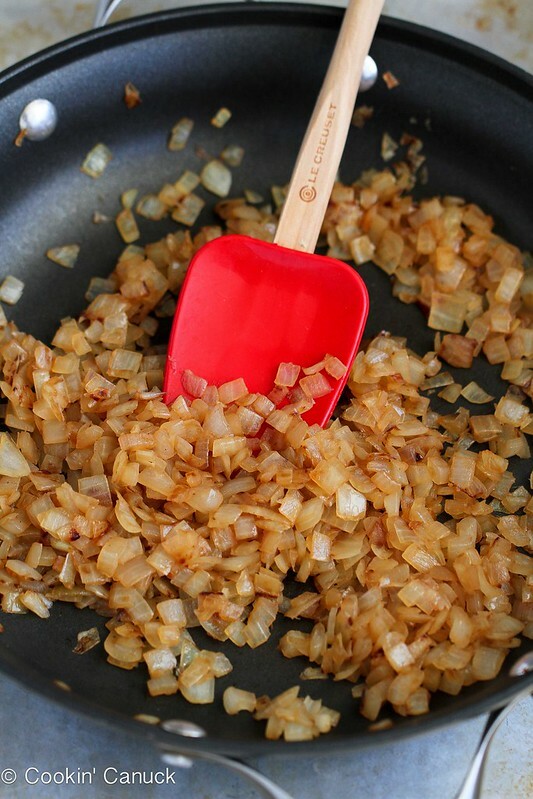 Add the onions and cook, stirring occasionally, until the onions are golden brown. Place cubed potatoes and cauliflower florets in a large saucepan and cover the vegetables with cold water. Bring to a boil and cook until the potatoes and cauliflower are tender when pierced with a fork, about 15 minutes. Drain the vegetables, return to saucepan and set over medium heat, stirring the potatoes and cauliflower until dry, 1 to 2 minutes. Using a food mill, potato ricer, hand mixer or potato masher, mash the potatoes with the almond milk to remove the large lumps. Add the cream cheese to the potatoes and continue to mash until the potatoes are smooth and the cream cheese is incorporated. Stir the caramelized onions and roasted peppers into the mashed potatoes. Season with salt and pepper. Serve. Disclosure: This post is sponsored by GO! Veggie Foods. Product and giveaway items were provided by GO! Veggie Foods. All opinion are my own. This looks like it would be a great addition to any holiday menu. I follow a vegan diet and am always trying to find new recipes that will appeal to the non-vegan eaters at my table too… thanks for sharing! This is full of so much goodness! Love this recipe! Love this! These look divine, can’t wait to try these! Thank you so much for the recipe. I’ve always wanted to know how to make this. Great vegan option for Thanksgiving or any time of the year! Gorgeous recipe, Dara! I love mashed cauliflower and you’ve elevated it to a whole new level with all these savory additions! This looks delicious. I would make this for sure. This looks like the perfect side dish for my vegan friends coming to our holiday dinner. What great timing! 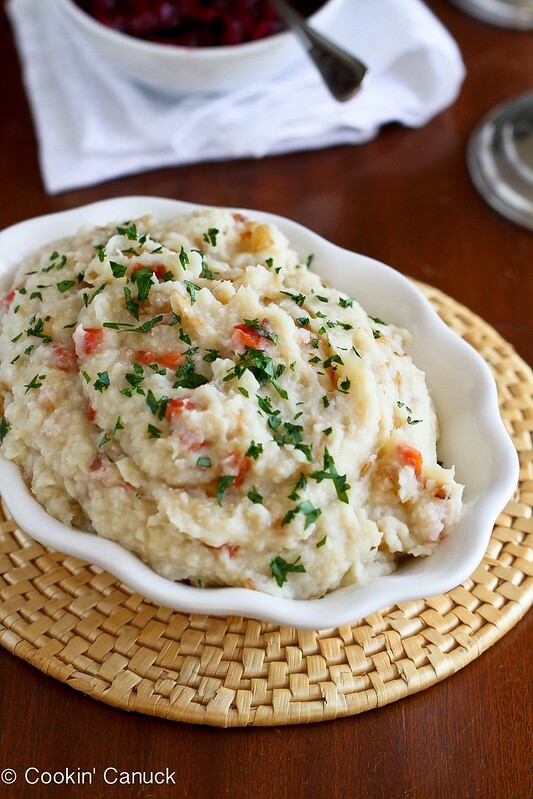 Will definitely be trying your mashed potato & cauliflower recipe! Thanks for posting it, and also turning me on to a product, new to me, Go Veggie! I love mashing cauliflower with potatoes, but you elevate it to a whole new level! I have been looking for a lighter mashed potato recipe. Can’t wait to try this one out and love the added peppers for color and extra jazz. Thanks. This looks absolutely delicious! Hearty and so creamy… I love it! This looks amazing!! I’ve been experiencing with cauliflower quite a bit lately. I love the roasted peppers and caramelized onions, great side dish! Cauliflower has become my families favorite vegetable lately it is so versatile! Roasted, mashed, sautéed, steamed I can’t wait to try this recipe too! This recipe looks amazing. There are no vegans at this years Thanksgiving dinner, but this recipe will be on the menu! I’m adding this recipe to my Thanksgiving menu this year. Such a perfect Thanksgiving side dish! I love combining mashed cauliflower and mashed potatoes! This is one gorgeous and flavour packed mashed potato recipe. I was stopped in my tracks by the photo with the onions, beautiful shot, perfect colour. I love all the add ins to this. I need to try for the family. And I had no idea you could get vegan cream cheese. Very cool. what is the utensil you used to mash!? i’ve never seen anything like that, at least i don’t think, however i’m pretty sure i want it! As stupid as this sounds, I have heard of mashed cauliflower and mashed potatoes, but it never occurred to me that a mix of the two might make a great dish. This recipe looks wonderful! Even though I’m not making Thanksgiving, I might just have to make this for dinner one of these days! What a great way to dress up potatoes! The Vegan Mashed Potato & Cauliflower dish looks so good that I can’t wait to try it out and add it to my Thanksgiving dinner menu. 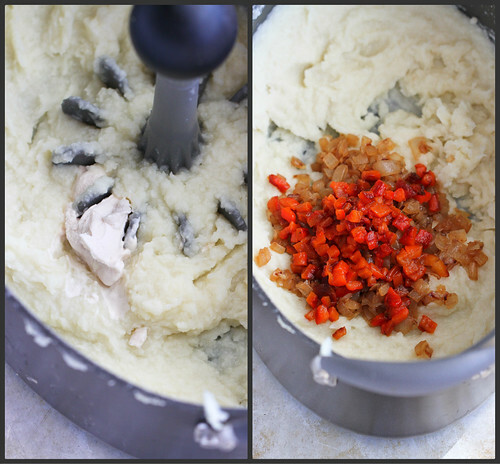 I love the red and green in these mashed potatoes – reminds me of Christmas! Glad I came across this post, that looks delicious! Oh Dara this looks so good! I love how you incorporated cauliflower with the potatoes. YUM! These look so decadent! Great idea! I’ve never heard of Go Veggie! I will definitely keep my eyes peeled for it in the grocery stores around here though! Will have to give Go Veggie a try! This sounds so good, can’t wait to try it! I can’t wait to make this and am sure I will love it– made the butternut squash chicken stew for the third time in a month, today! I’ve been meaning to try these products. If I win, that would be the perfect opportunity! Thanks for the giveaway! This sounds and looks so delicious!! Love the red pepper addition!! Oh yum, the flavors in this recipe are just perfect 🙂 I can’t wait to get a taste of this!! These taste amazing. The flavors make this dish the best mashed veggies dish I have ever had.let alone the eye appeal makes you anticipated how delicious out is. Thank you for sharing this with us. I’m so glad to hear that you enjoyed them, Anna! Thanks for letting me know.